What do you think 2018 holds for electric vehicles (EVs)? There are many signs that 2018 will be a monumental year for EVs. Last year we saw many automakers commit to some form of vehicle electrification. 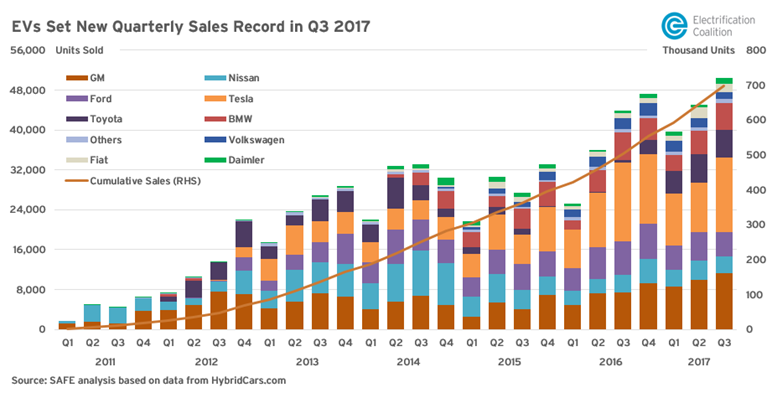 In addition, 2017 saw record numbers of EVs hit the road across the US. There is a lot of momentum in the world of EVs and it looks like we’ll see a much matured EV market in 2018. Probably nothing is more reassuring about EV trends than a look at where the money is going. As usual, if you want to know where the action is, follow the money! A Reuters analysis shows that recent total investments in batteries and EV technology from many of the world’s major automakers totals over $90 billion, and continues to grow. Automakers who are putting their money where their mouth is on electrification include Ford, Daimler, Volkswagen, GM, Tesla, and several Chinese automakers. Reuters says the EV investments break down by country in this way: $19 billion in the United States, $21 billion in China, and $52 billion in Germany. These massive investments follow a wave of new transportation regulations. 2017 saw many of the world’s largest economies put a deadline on the combustion engine. Germany, China, France, India, Britain, and many other countries have set dates after which it will not be allowed to sell diesel or gasoline-powered cars within their borders. California is also currently considering putting a deadline on the combustion engine. The people have spoken and automakers are listening. Know anyone who is waiting for their Tesla Model 3? The much-anticipated and hotly-demanded Tesla Model 3 officially went into production in 2017, but production issues resulted in very low volume production. It looks like 2018 will be, for the vast majority of Tesla customers, the real year of the Model 3. With more than 400,000 pre-orders on the books and production rates currently at 1,000 vehicles per week (and expected to rise to 5,000/week by June), you should (hopefully!) begin to see the first mass-market Teslas in your town or city this year. All of these trends and announcements add up to a truly exciting and interesting year ahead! What are you most excited for in the world of EVs in 2018? Are there any big trends or developments that haven’t been included here? Reach out to us on Facebook or Twitter and let us know!